Appalachian Mountain Roots: Have You Ever Eaten Leather Britches? Last week, I was in need of some comfort food. Whew, what a week it was! My husband was in Costa Rica for work and since it was just my son and I to cook for, we started the week off with simple suppers of a sandwich, soup, or takeout. That lasted until about Wednesday and I was ready for some REAL food. 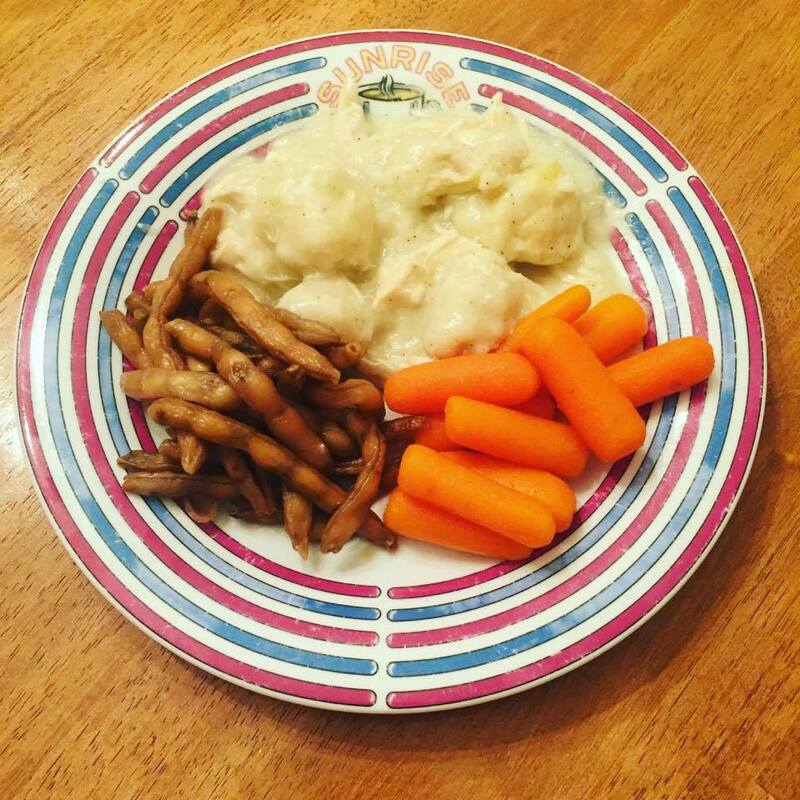 I decided on a menu of chicken 'n dumplins, sourwood honey glazed carrots, and leather britches. Some of you may be wondering, "What in the world are leather britches?!" No, I didn't cut up and cook a pair of leather pants. Leather britches are what people in my part of Appalachia (western NC) call dried green beans. As you can see from the picture below, dried green beans are wrinkled and brown...much like what a pair of wet leather pants end up looking like once they've dried. These dried beans are also called shuck/shucky beans and fodder beans in different parts of Appalachia. Long before canning jars and freezer bags, people needed a way of preserving food for the winter and most vegetables and fruits were dried. Beans were a main staple to be "put up" because they provided a great source of protein throughout the winter months. According to the Encyclopedia of Appalachia, "Two drying methods were commonly used. For both, the bean was harvested when mature but while the pod was still edible. The first method involved stringing whole, unbroken pods, like stringing popcorn for Christmas garlands. Using a big darning needle, the processor carefully inserted strong thread between the two middle beans in a pod. When the string of whole beans was three to four feet long, the thread was knotted and the string of beans hung to dry, traditionally in such places as the porch, from roof rafters, or on a wall behind a wood burning kitchen stove. The beans slowly dried, turned straw colored, and shriveled. 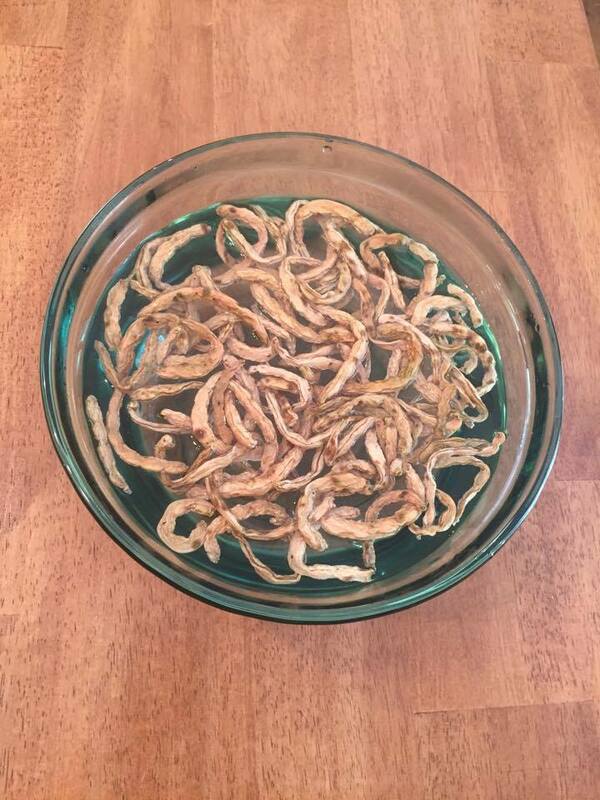 After drying, they were stored in cloth sacks or, more recently, in glass jars or freezers." I use the first method to prepare my beans and hang them up in a warm upstairs room. 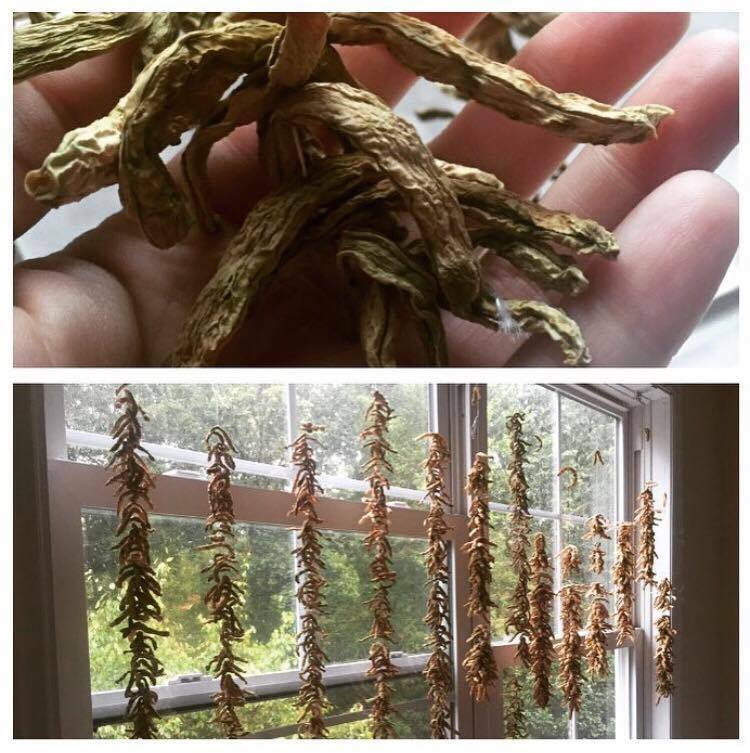 Once dried, I remove them from the strings and store them in glass Mason jars. 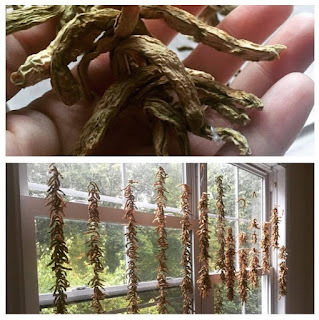 "The second method was to snap the pods into bite-size pieces, then spread them on white cloths and place them in a sunny place to dry. Many women chose to break their beans before drying because it was nearly impossible to pull the threads out of beans dried by the stringing method." My husband's Granny Bertha used this method but would spread the broke beans out on a cookie sheet and place it in the back window of her car until they were dried. 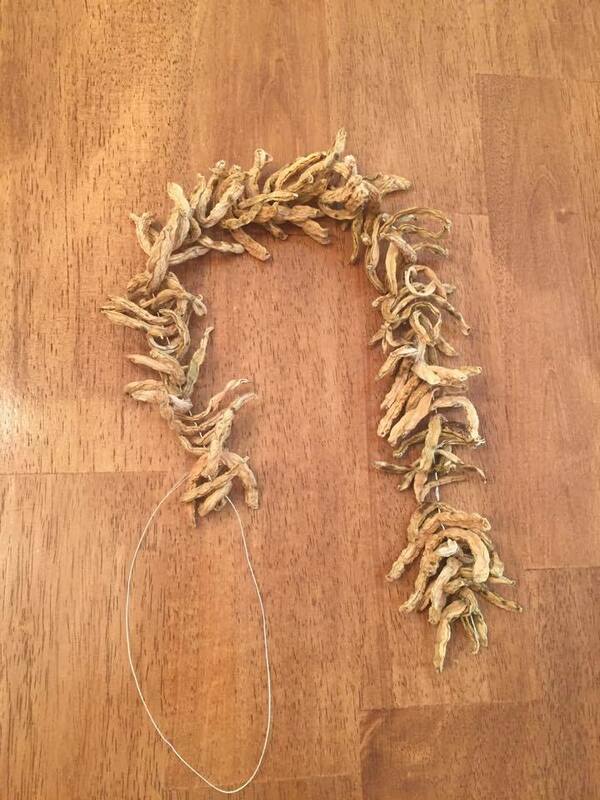 I always remove the strings from the beans before I thread them up into the "garland." I use kite string but any good strong thread will do. I found that it took around 4 weeks for my beans to be completely dried but the time will differ based on the temperature and humidity of where you choose to dry them. When I'm ready to prepare the beans, I soak them in a bowl of water over night...just as you would any dried bean. The next morning, you'll notice that the beans have swelled back up to normal or close to normal size. Drain the water and add the beans to a pot. Cover the beans with fresh water and add a piece of fatback or bacon. Bring the beans to a boil and then reduce heat to a simmer. Cook until the beans are tender. I've had some people tell me that you can cook these beans in a slow cooker all day and I plan on trying that method out very soon. I'll let you know how they turn out! I canned most of my green beans this year (white half runners and greasy backs). 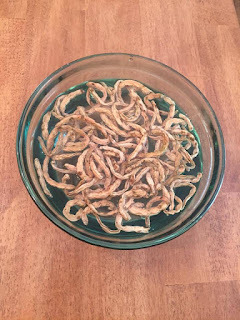 Even though canning has replaced the need for drying beans, I feel connected to my past when I string up, dry, and then cook a pot of leather britches. The intense meaty flavor and good memories they bring will probably encourage me to continue working up and cooking them for many more years. Isn't it amazing how a bite or smell of certain foods can transport you back to a different place and time? My great grandma Collett (Mamaw) always had leather britches for holiday meals. After my first bite, I was taken back to sitting in Mamaw's kitchen while she buzzed around making sure that everything was ready to be enjoyed by her family. Food seems to provide an express ticket to Memory Lane for me. Have you ever had leather britches? Is there a certain food or foods that take you back to a different place and time? Please leave a comment and let me know. I'd love to hear from you!